Three Honors College students, Nicole Adkins, Amanda Gozner and Hallie Wright, are conducting laboratory research in the United Kingdom during the first half of March. Below, they have chronicled some of their experiences as they analyze the DNA of ancient plants. Their work is being funded by a faculty-led research grant through the Honors College. To learn how you can receive funding for undergraduate research, click here. Life is short- eat that piece of cake or chocolate!! Know your work well but never consider yourself an expert on any singular topic- there is always so much to learn each day! To end our time at the Uni, we attended an end of term party with Rosie and the other lab members while drinking wine and eating snacks. We will definitely be anxious as we wait for Rosie to get DNA sequencing results back (the Illumina was unfortunately completely booked this week). While we hope the results show ancient cotton DNA, regardless of the final results, we learned an immense amount and were able to broaden our cultural horizons. To say the trip over here was well-worth it would be a total understatement. Once again, being abroad has ignited my passion for adventure and growing into a more worldly individual. I truly hope that this will not be my last time in the UK. For now, I am looking forward to starting another new adventure in my life- graduate school this fall! I am confident all the skills I learned during this research program will prove useful during that time. The last Day in Lab! Sadly today was our last day in lab. Since the sequencing of the sample’s DNA will not be happening until after we get back to Purdue our last day actually doing lab work is today. So basically what we did today was get the samples ready for the sequencing which will hopefully occur next week. We did another Qubit measurement of the samples in order to figure out the concentrations of DNA in the samples. We then used these measurements to figure out their molarities. This was done to properly calculate how much we need to dilute each sample. It is important to note that from this point on we are no longer testing sample 5 which is one of Dr. Wendel’s samples. The sample had too little DNA. After we calculated the dilution amount we diluted the samples with water and combined all of the samples. We can combine the samples because they each have different indexes to identify which DNA is which. We then did another Qubit measurement to make sure the molarity is at the point we wanted. Since we had so little to do today we had all of the afternoon for free time. So, we went to Oxford! It is an extremely beautiful place; I took so many pictures. The buildings of the colleges there were absolutely gorgeous and their architecture was so beautiful. It was such a wonderful place we stayed there literally until the very last possible train we could take. We got to see some of the buildings from Oxford University and the other universities in the area. They were gorgeous! I wanted to take pictures of everything (I find architecture very interesting so I tend to take a ridiculously large amount of pictures of buildings). I am very glad we got to go there. While we had dinner, we were sitting next to an American band called Ryan Kinder! It was amazing because I haven’t been around a lot of Americans while here so we were talking to them while we ate which was really fun. It was an amazing coincidence’s to sit next to them. Sadly, I will only be here for a tiny bit longer. I really enjoyed working with Rosie, Nicole, and Hallie. It was a fantastic experience and I will be sad to not be working with these lovely ladies on a daily basis anymore. It was truly an amazing time working with them. They have great senses of humor and it was an amazing time traveling around England with Nicole and Hallie. I will honestly miss being here. This experience has been amazing and I will truly cherish the time I had here. I am Amanda Gonzer. I am an Honors Major in Anthropology and two minors in Chemistry and Forensics Science. I am the only one out of the three of us students currently in England that does not actually have lab experience. Unfortunately, due to large class loads and work, I have not had time to participate in it. I plan to start working with two professors (Dr. Buzon and Dr. Otarolla-Castillo) next year on their research to further my experience in labs and working on research. I would highly advise doing lab work, even though we have spent a short time in the labs here in England, I have found it extremely interesting and a valuable experience. The reason I chose to come on this trip is because I wanted to experience labs before I worked with the two previously mentioned professors. I also wanted to come on this trip because I have never actually left the United States before. I had my first international flight last Saturday and my first time in a country where I didn’t speak their language (Nicole and I had a connecting flight in Germany). It is amazing being in different countries. I honestly am so happy that I was able to be here and so appreciative of the grant that Dr. Brite received for us. Without that grant I might not have been able to actually come. During this week I also have to take 3 tests while I am in England. This has caused me to do an extensive amount of study while I am here on top of the assignments in my classes that I have due while I am in England. In the future I am going to try to get more of my course work done before I leave the country. We generally have a lot of free time in the afternoons so I have had time to accomplish what I need to without it affecting my experiences here, but in most circumstances that probably won’t be the case. I also like how they proctored our tests. We just had to make sure we had what we needed and Dr. Allaby brought us the tests and made sure to know how much time we had. It was a super easy process. For Tuesday and Wednesday we were not actually in the lab. A majority of our time has been spent doing readings on coding and the different procedures we will be using on Friday and next week. I have no idea how to code so I’m interested to see how it goes next week and while we are back at Purdue when we start doing some of the analysis of the data. I am very happy that Rosie is giving us papers to read because I would much rather spend time reading a bunch of articles about the process than having Rosie explain the process to us as we watch. Welcome to today’s episode of “Can We Teach a Scientist How to Code.” No, but really, can we? My name is Nicole Adkins. I am a sophomore majoring in Biochemisty- Pre-Med in the College of Agriculture at Purdue. Here’s a little background to get you up to speed about why I am here before delving into today’s itinerary here at the University of Warwick! As a freshman I worked closely with Dr. Puthiyaveetil researching the effects of non-conserved promoter sequences on chloroplast gene turnover rates in a plant called Arabidopsis Thaliana. After about a semester, I decided to end my research in plant genetics to transfer to Dr. Gowher’s lab where I now work closely with cancer research, being that I want to be a Pediatric Oncologist after I finish school. Anyway, I did a lot of database and computer based research for the plant genetics lab and I never got to apply my newfound plant genetics knowledge to bench work research. So, when Dr. Brite emailed me about my fit for this project at the University of Warwick to help sequence ancient DNA from cotton seeds she found while in Uzbeckistan, I couldn’t say no! This was my time to be able to apply what I learned about plant genetics research last year and the bench work skills I have required in my new lab this year, so I went for it! So, here I am in the beautiful country of England at one of the best archaeogenomics labs in the world trying to uncover more about these ancient cotton seeds! As Hallie mentioned in her previous post, WE HAVE DNA! Yesterday we also started the cooking process for more seeds from Dr. Brite and Dr. Wendel, a professor from Iowa State, to see if we could retrieve more DNA from other seeds to add to our library. Because this cooking process takes 3- 5 days, we will not be returning to the lab until Friday. Until then, Rosie, the post-doc researcher we have been working under, is giving us a crash course in the data analysis portion of the research. This includes how to sequence the DNA and coding, yes I said it, CODING. Being a Biochemist, I have not done any type of coding in my entire life. This word naturally has a negative connotation to me from the various overheard conversations from numerous fed-up engineering students who’s codes can never be “right the first time” or that they have to do another dreaded “coding assignment that could take hours.” So to break this stigma there is only one way to approach it, head on. 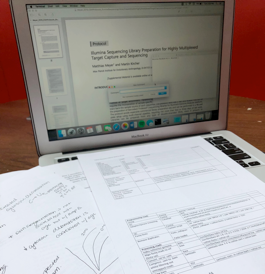 I am currently sitting in Warwick’s Student Union trying to make sense of these lines of commands that Rosie gave us to play around with and also reading numerous papers about the DNA sequencing methods and instruments we will be using later on in our research. Preparing the DNA for sequencing is not going to be the tricky part for me, it is very similar to the ligation and PCR protocols I work with almost every day in my research lab at Purdue. However, let’s see if this scientist will ever be able to learn how to code! My name is Hallie, and I am a senior studying Plant Genetics, Breeding, and Biotechnology at Purdue. I’m very excited to be one of three participants in an archaeogenomics of old world cotton research project. Thanks to an Honors College grant and the help of Dr. Brite (Purdue) and Dr. Allaby (Warwick), I have the opportunity to travel to the University of Warwick in the United Kingdom in an attempt to sequence some cotton aDNA. It’s safe to say the “Beast from the East,” otherwise known as the Euro snowstorm got the best of me. My flight itinerary did not go as expected, to say the least. My flight from Chicago to Dublin was delayed two hours, then when we arrived, we had to wait another hour to walk off the aircraft. Upon arriving to Dublin, I found out that I didn’t just miss my flight to Birmingham but that it had been completely canceled due to the weather. After spending hours waiting in numerous lines, I found out that a) my checked luggage was nowhere to be found and b) I was stuck in Dublin, Ireland for over 24 hours. Despite the challenges, I tried to make the most of my time in one of my favorite cities. It was nice to walk down the cobblestone streets again and revisit some pubs. After getting to walk around the city for awhile, I finally got to board my flight to Birmingham. Once I arrived at the airport and watched the luggage carousel, I realized once more than I would have to go on without my checked bag. You never truly realize how much you appreciate your day-to-day items until you no longer have them. Take using a towel to shower for instance- without my suitcase at 9pm, I had to use a t-shirt to dry my hair. This morning, however, was a new day, and it was a day well-spent at Gibbet Life Sciences getting to start the aDNA sequencing project. The building is huge, and I was amazed at how many researchers of different areas there are- proteomics, neuroscience, genetics, ecology, epidemiology… you name it. Our first task was to watch Rose- a postdoc in the lab- prepare samples for extraction. While she wasn’t entirely optimistic about the DNA that would be found, at the end of the day, she discovered that she was able to extract enough DNA from one seed to construct a library- fantastic news! We hope that the DNA is from cotton and not bacterial DNA due to contamination, but the only way to tell is to fully sequence the samples. In that case, we each prepared a sample for incubation which will be ready for an extraction on Friday. Tomorrow is another day, and I’m praying the luck of the Irish will be with me and that I may have information regarding where my missing bag is… otherwise, I think it’s about time for me to take a trip to the city center to buy a new set of clothes.